This was taken in February in the Lake District and I love the interactions between the children and their parents – I wonder what they’re saying to each other? Making this image black and white brings all the attention to their expressions. A personal image of the incredible cherry blossom on the school run. It always lifts my spirits! I’m sure you’re with me in looking forward to the gentle warmth of Spring and seeing the flowers bloom again. 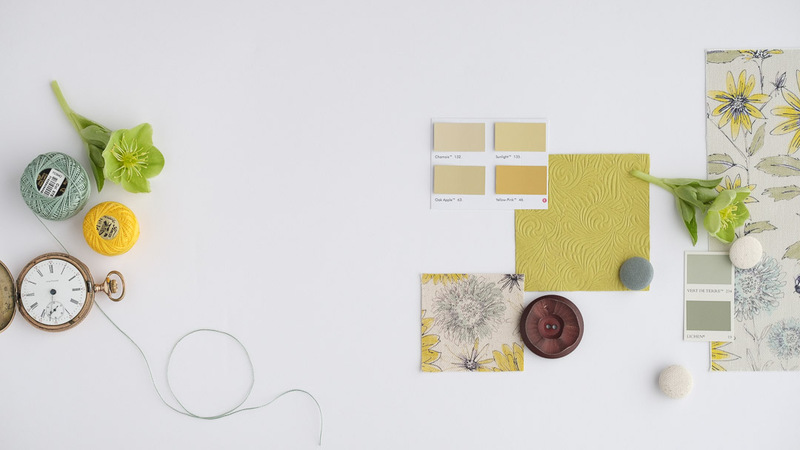 Now for a flat lay for designer Naomi Sisson’s Seed Home Designs home page. We knew the intended use for this image and so deliberately left space for her to insert Seed Home Designs’ circular logo. Naomi creates beautiful nature and flora inspired fabrics for the home and has a growing range of accessories too – if you’re not already familiar with her work do take a look at her website and instagram feed. Naomi also upholsters furniture with her designer fabrics and these black and white images show the artisanal nature and quality of her work. Another commercial project showing designer Chloe Hardisty of Cotton Clara at work in her studio. Chloe designs homewares inspired by Scandinavian design, pattern and bold pops of colour. Environmental portraits are a fantastic way of showing your customers how you work, what inspires you and the process you use to make your unique products. I wrote a blog post about Chloe a few months ago which you can read here. My friend Minal and her gorgeous spaniel, Rocky, braved the drizzly British weather and with pockets full of dog treats we set out for a walk to capture these portraits. Each one tells a story of their relationship – and the anticipation of another treat! Dogs are important members of the family so do bring them along to your next family shoot. Rhiannon’s Scandinavian-inspired home was the setting for these business portraits of Rhiannon Payne who runs an interior design consultancy, My Designer Friend. This next image of Hayley is perhaps an unlikely one as it was taken at the end of a business portrait session. We wanted to create something a bit different and I have to say, it was my favourite image of the shoot! A family shoot next and we used two locations and different outfits as you’ll see. Beautiful soft light and rustic, peeling paint provided the setting for this image of Melanie and her son, Daniel, and daughter, Grace. Esme was full of character and if you know her you’ll agree that the centre image captures her personality perfectly – cheeky, funny and totally adorable! Big brother Daniel gave her a piggyback towards the end of the shoot as little legs were getting tired. The portrait on the right (below) is one of my favourites of the whole year because it captures each child’s personality perfectly. There’s little bit of sass going on with Grace on the left, Daniel is looking straightforward and Esme – well Esme is just being Esme!! The colours of Autumn are rich and warm and who doesn’t love to throw a few leaves?! We caught the last rays of sunshine for these backlit portraits of Esme and Daniel. These portraits of Eloise were captured on a rainy day but it just goes to show that beautiful light can be found if you know where to look. You can see more from this shoot here. The light was just stunning for this next shoot and I’m in my happy place where there’s long grass and the intense greens of Spring and early Summer have faded. This was in October and you may recognise Rhiannon from earlier in the post – here she is with husband, Joel, and their son, Huckleberry. I wanted to capture the family as they left the woodland and stepped into the light beyond. The trees frame them perfectly as the rim light catches their hair. It’s important to feature mum and dad’s relationship too! These personal branding images are of Naomi Light who runs a coaching consultancy for women called Gumptious. I don’t know what we were laughing about but I always try to make my shoots fun! These last images are of designer Naomi Sisson and I’m very excited that she (and some of my images of her and her products) will be featured in several magazines very soon so stay tuned! So, that’s it! I hope you’ve enjoyed seeing some of my favourite images from 2017. If you’re interested in booking a shoot or want to have a friendly chat about your business then do get in touch, I’d love to hear from you. I’m looking forward to meeting you and lots of lovely new clients in 2018!